Educational video tapes for teaching the playing of musical instruments. Teaching the playing of musical instruments. Video music lessons and music books. Sheet music, music folios and music books. 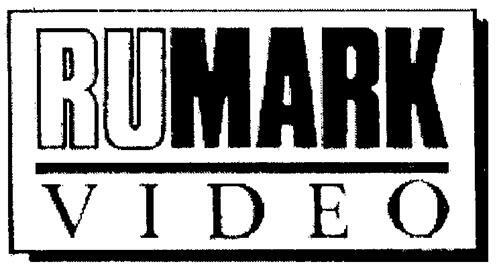 On Monday, August 11, 2003, a canadian trademark registration was filed for the above pictured logo by RUMARK VIDEO INC. Suite 200, 75 Albert Street, Winnipeg, MANITOBA, CANADA R3B1G3. The Canadian IP office has given the trademark application number of 1187006. The current status of this trademark filing is Registration published. The trademark is filed in the description of Educational video tapes for teaching the playing of musical instruments. , Teaching the playing of musical instruments. , Video music lessons and music books. , Sheet music, music folios and music books. .
Mark Disclaimer: The right to the exclusive use of the word VIDEO is disclaimed apart from the trade-mark. (1) - Educational video tapes for teaching the playing of musical instruments. (2) - Teaching the playing of musical instruments. (3) - Video music lessons and music books. (4) - Sheet music, music folios and music books.